A new name on the sponsor list for the SPGC this year is Case IH/Aimtrac. Bill Greer, Regional Manager with Aimtrac’s Pinehurst, Georgia location, is pleased to be a part of the conference. “This is my first time being here,” he said. 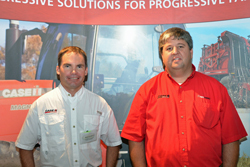 “Seems like a really good turnout.” Bill is pictured here on the right with Case IH colleague Richard Carver. Aimtrac is a relatively new company with four Case IH locations in Georgia, including Americus, Camilla and Brooklet that all serve a good number of peanut farmers. “I think Pinehurst and Camilla have the largest number of acres,” he said, noting that he’s seen some of his local growers at the conference.